Collect email addresses and build your email list form free via text message. Captured email addresses can by synced into CRM's via API or Zapier. Automate captured lead follow up with our intelligent drip campaigns. Filling our forms on mobile is painful. Replace email capture forms with our form free email collection call to action. View an instant demo by texting your address below. You'll receive an instant response to see the email capture system in action. There are many use cases for using form free email collection. Public speakers can use this to deliver offers or presentation via text while building email list. Direct mail marketers can use form free email collection on direct mail pieces. 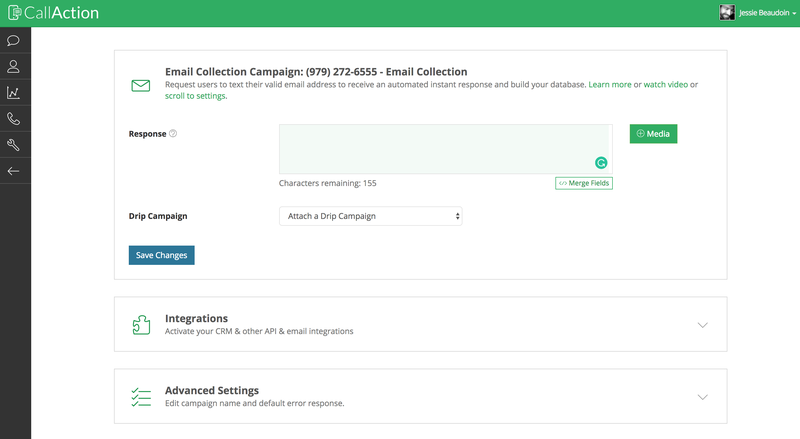 Track your email collection campaigns using a dedicated phone number. Learn how to setup form free email collection tool below. Below are detailed step by step instructions for email collection. You'll be redirect to Email Collection Tool settings. Your email tool is setup to capture emails. You can setup some integrations or advanced settings if needed. Captured email addresses can be synced into your CRM in real-time. View email tool advanced settings. Default Answer: This is message users receive if they text an invalid format email. You can now setup a custom drip campaign to follow up with your captured email leads. Every free trial of this email capture tool includes access to our powerful all-in-one sales and marketing automation platform. Try this email tool along with our text for info lead generation solution. Take 10 mins to signup for your free trial of CallAction.co now.